Will South Africa's leader show the same impressive technique when it comes to balancing the books? Picture the scene: the World Cup has culminated in a thrilling finale, Johannesburg's Soccer City stadium has been swept clean and South African officials are nursing their post-tournament hangovers. But the nagging headache is not a result of overindulgence - rather it is the question over who is now going to pay for it all. One thing is for sure, football's world governing body, Fifa, will not be forking out. Fifa will pocket the vast majority of the money raised by the sale of media rights and global sponsorship deals as well as some of the income from ticket sales. South Africa, on the other hand, will be paying the costs. There are few cast iron laws in economics but one seems to hold - the organisers of sporting mega-events always overestimate the economic benefits and underestimate the costs. Yet, even in an era of global economic uncertainty, governments are falling over themselves to host tournaments. Ten countries, grouped in eight bids, are fighting to host the World Cup in 2018 and 2022. They are all armed with reports and projections from management consultants and all believe that they can put on the show at a reasonable cost, returned many times over by the economic benefits that come from hosting. History, however, suggests a different outcome. Japan's gigantic infrastructure programme for the 2002 World Cup, for one, barely shifted its sluggish economy. The 2000 Sydney Olympics, it was argued, would transform future visitor numbers to the city but they have remained static. 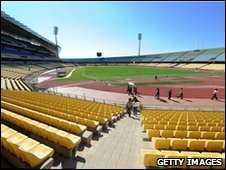 Then, four years later, the Athens games were going to be put on for $1.5bn (£1bn); that ended up costing 10 times as much. Economists who have tried to quantify the impact of these occasions on job creation have found that there are almost no long-term employment benefits. There is, however, ample evidence of underestimated costs - countries left with underused stadiums and facilities which are ruinously expensive to maintain. This, it seems, could turn out to be the case for the South African World Cup too. In 2004, when Fifa awarded the tournament to the country, consultants Grant Thornton predicted costs of just $300m on stadiums and infrastructure and a boost to gross domestic product of $2.9bn. 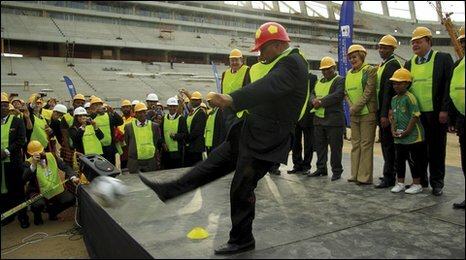 Today we know that $300m would not have even covered the cost of rebuilding Soccer City, where the opening game and final will be held, let alone the other $1bn needed to build and refurbish the other stadiums. When the costs of upgrading airports, inner city transport, telecoms infrastructure and the actual running of the show are counted, the total bill for the World Cup has risen more than tenfold, to almost $4bn. So, as the costs have increased, have the likely economic gains for South Africa also increased? At this stage, it looks like South Africa may struggle to make the $3bn originally forecast. On the other side of the global economic downturn, the projected figures on visitor numbers and their anticipated spend look very optimistic. Fifa's ruthless defence of its brand and the interests of its main sponsors mean that there are restricted opportunities for traders and small businesses to get a slice of the tourist pie. Of course, there have been real economic benefits for those employed in construction work, but the boost has gone mainly to people who run and own the companies managing the work. Along the way, there have been controversial demolitions of informal housing, allegations of corruption in the awarding of contracts and bitter labour disputes. While the stadiums are now finished and impressive, many are destined to mutate into white elephants, their costs and capacity massively exceeding the means and needs of the local football economy. In Portugal, which built 10 stadiums for the 2004 European football championships, Augusto Mateus, a former economics minister, argued that the most sensible thing to do with many of these buildings is to pull them down and start again. In South Africa, while there may be the legacy of an improved transport infrastructure, its future remains dependent on a successful resolution to the simmering conflict between the established taxi industry and the new buses. 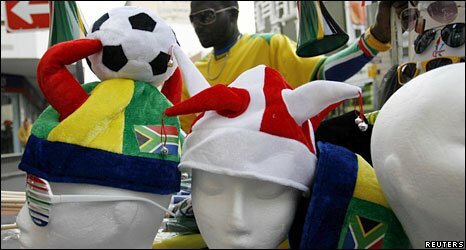 Yet, in the face of this economic uncertainty, South Africa remains resolutely upbeat about the gains of hosting the World Cup. The reason is that there are some things which are hard to put on a balance sheet. Here we are in the realm of intangibles. This is the soft power derived from hosting the world's biggest football festival and of being the first country on the continent to hold the competition. The opportunity is there to reshape global perceptions of South Africa - and possibly the rest of Africa - and the theory is that this could be rewarded by higher flows of capital, skilled workers and tourists. But in the build-up to the tournament there has been little movement in the way South Africa is perceived by the outside world. Although the country has demonstrated it has the capacity and ability to take on complex construction projects, the focus of the world's media attention has been on violence and the crime rate. Even incidents outside the country - such as the attack on the Togolese team on the eve of the Africa Cup of Nations in Angola - led to questions in the European press about safety in South Africa. The tournament organisers also seem to be promoting an image of Africa peddled elsewhere in the world. The video shown in Cape Town before the competition draw featured pyramids, rural people in traditional dress and large mammals. Urban Africa, with its love of football, was downplayed. Will happiness help the hangover? What then is left of the economic case for hosting the World Cup? Well, happiness could play a crucial part. This is not a flippant response. Indeed, economic research suggests that the hosts of major football tournaments experience a real rise in public contentment. The theory is that investing in projects that create a rarely experienced but precious sense of national purpose, and collective identity, are good value. The snag here is that all the work on happiness so far has looked at richer nations. Some may argue that in the case of South Africa there are practical things like new housing and sewage systems which should have been invested in first. But it is very likely that hosting Africa's first World Cup will provoke a wave of national and continental joy that will be infectious. The challenge will be to capitalise on this and turn it into tangible development. Did World Cup lead to 'sardine run' angling ban? World Cup: Bridging SA's sporting divide? Thousands of Sowetans flock to their local football stadium to watch Bafana Bafana, at one of the nine cities across the country hosting "Fan Fests".